From the stage to the catwalk, join Capital as we take a look at Lady Gaga and a host of other music stars who have been hitting London Fashion Week. 1. 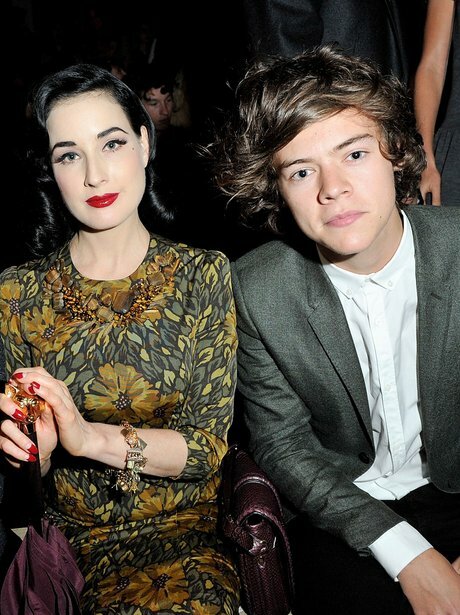 Dita Von Teese And Harry Styles sit next to each other at London Fashion Week. 2. Pixie Lott attends the David Koma fashion show as part of London Fashion Week. 3. Pixie Lott wears her famous cat ears alongside boyfriend Oliver Cheshire at London Fashion Week. 4. Lady Gaga sends out an enviromental message as she leaves her hotel for London Fashion Week. 5. Harry Styles hits the Burberry Prorsum catwalk show as part of London Fashion Week. 6. Harry looked stylish in a white shirt with with blazer and black trousers. 7. The One Direction star's famous curls were also on show as he arrived for the Burberry event. 8. Lady Gaga wears a flower hat at the Philip Treacy Spring/Summer 2013 collection. 9. Lady Gaga wore a pink veiled dress during one section of the Philip Treacy fashion show. 10. Lady Gaga on the catwalk during the Philip Treacy fashion show. 11. Lady Gaga leaving The Royal Courts Of Justice after watching the Philip Treacy show. 12. Pixie Lott and Oliver Cheshire arrive for the Mochino Cheap And Chic Spring/Summer 2013 collection. 13. Lady Gaga holds her arms out wide as she speaks to the audience during the Philip Treacy show. 14. Pixie Lott attends the front row for the Temperley show at London Fashion Week. 15. Lady Gaga wearing a pair of Mickey Mouse ears at London Fashion Week. 16. Lady Gaga on the catwalk during the Philip Treacy fashion show.